A unique slamming process is observed on high speed wave piercing catamarans (WPCs) such as those manufactured by INCAT Tasmania (shown in Fig. 1). For conventional catamarans, wet-deck slamming constitutes a significant design load and is managed through proper design of the tunnel height for the proposed operating conditions. 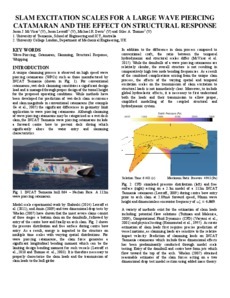 While methods have been developed for prediction of wet-deck slam occurrence and slam magnitude in conventional catamarans (for example Ge et al., 2005) the significant differences in geometry limit application to wave piercing catamarans. Although slamming of wave piercing catamarans may be categorised as a wet-deck slam, the INCAT Tasmania wave piercing catamarans include a forward centre bow to prevent deck diving which significantly alters the water entry and slamming characteristics.